The link to sign up for heats at tonight's Friday Night Lights is live. Click here to sign up. This is our final Friday Night Lights of the season so we hope to see many of you there. Remember, you don't have to do the WOD to join us. It all starts at 6pm. 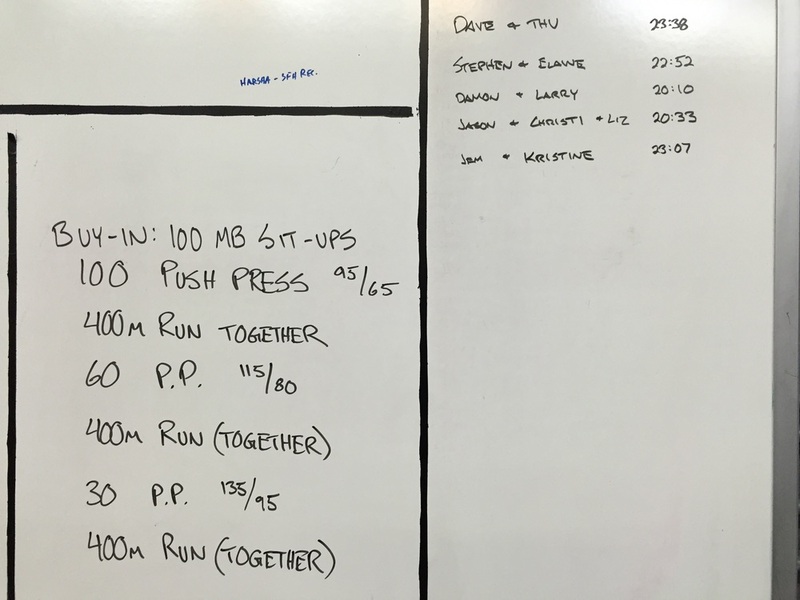 If you participated in the CrossFit Games Open in 2014, you remember this WOD far too well. Thrusters and Burpees; 84 total reps of each. Visit the Games website for details and scaled options or get all the deets when you arrive. We'll be running this workout in all classes today as we've done the last four Fridays. Enjoy! Friday Night Lights is at 6pm tonight! You don't have to wait to do the workout until then; we are doing it in all classes today. Similarly, you don't have to be doing the workout to come to FNL; just come and have fun! Like last week, sign up for a heat ahead of time. The athlete briefing at 6:15 is optional. If you skip the briefing, you are expected to know the details and standards of the workout. Sign up here. If you ready yesterday's post, you now know what The Open is. So how does it work? A workout is announced every Thursday for 5 weeks starting today at 5pm. Official participants are given until the following Monday at 5pm to complete the workout and enter their score online at games.crossfit.com (where you signed up). You enter your own score, the gym doesn't/can't enter it for you. At Acuo, we will make Friday's WOD the Open workout all day. If you are a registered participant, you need a judge to watch you do the workout one-on-one and score your workout. Keep this in mind as there is only one coach per class and many participants. This means you'll need to find someone to judge your workout. Fridays at 6pm we're hosting Friday Night Lights which is a fun time to all hangout and do the Open workout and/or enjoy some food and social time. Tune in to games.crossfit.com at 5pm to watch the workout get announced live followed by a couple Games athletes doing the workout right away! If you've been a part of CrossFit for more than a year, you've probably heard of the CrossFit Games Open (aka "The Open"). If you haven't heard of it, it's safe to say you'll hear all about it in a couple of days. It's hard to explain briefly, but here's an attempt. The Open is worldwide CrossFit competition that takes place in Affiliates and home gyms wherever there are willing participants. It is the first step in a 3-step process to find "The Fittest on Earth" that culminates in the Games in California in July. So if you don't plan on qualifying for Regionals or the Games, why participate? Taking part in something so big, so much bigger than yourself, tends to push you just a tad harder and you find you're capable of more than you expected. It's also tons of fun participating with so many others locally and globally. One last thing to add is that it's an amazing test to compare yourself on year after year. More details in tomorrow's post, but to learn more visit games.crossfit.com. This work out starts by feeling too easy, then gets very difficult quickly. Enjoy! Reminder: we are closed this Saturday, February 13th for The Iron Open.